The Haitian Revolution, was a successful anti-slavery and anti-colonial insurrection that took place in the former French colony of Saint Domingue that lasted from 1791 until 1804. It impacted the institution of slavery throughout the Americas. Self-liberated slaves destroyed slavery at home, fought to preserve their freedom, and with the collaboration of mulattoes, founded the sovereign state of Haiti. It led to the greatest slave uprising since Spartacus, who led an unsuccessful revolt against the Roman Republic nearly 1,900 years prior. The Haitian Revolution was the only slave uprising that led to the founding of a state free from slavery and ruled by non-whites and former captives. News of the revolution was carried in newspapers in the newly founded United States. This item appeared in the Pennsylvania Gazette on May 2, 1792 by way of Boston. Since our last, several vessels have arrived from Port-au Prince, all of which bring the most gloomy accounts of the situation of that island; the distresses of which appear to be owing, not more to the revolt and devastation of the slaves , than to the enmity prevailing among the freemen, and the want of subordination to any government. 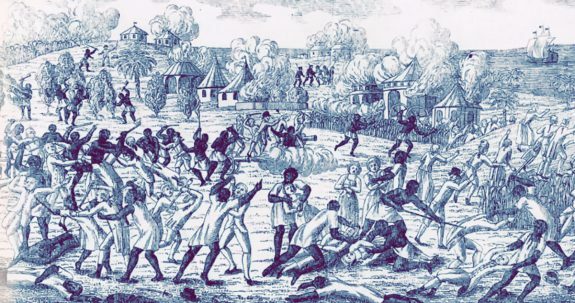 About the 13th of March, the negroes attacked the town of Leogane – set fire to the plantations on the plain, and were joined by the negroes thereon, who had till then been in quiet servitude: after much fighting and burning, the negroes retreated. Many were killed on both sides – the lowest number, including all parties and colours, is stated at 1000. Capt. Wellman, of Salem, who sailed from Port-au-Prince the 23d of March, at evening, informs, that 1000 militia and 500 regulars marched out that morning, said to be on account of the insurrection of the negroes on several plantations on the plain, who had drove their masters into town. – That they were met and opposed by the mulattoes, whose head quarters were only 4 miles from the town. – That he saw numbers of wounded brought into town while he was on shore – That the battle continued all day – and that its issue was unknown when he sailed. A detachment of the regular troops had been called for, by the municipality, to go to Leogane, at the time of the negroes attacking that place, and boats were prepared to transport them; but the officers refused to embark – as they said their orders were to defend the town of Port-au-Prince – they therefore could not answer for their quitting their station. For the same reason, they had also refused to march to the plains around Port-au-Prince. But the clamours of the populace, and of the private soldiers, being for action, the municipality caused the officers to be arrested, and sent to the Cape, in order to be carried to France. After this, new officers being substituted, the troops marched out, as before mentioned. The effects are to be dreaded, whatever apparent pleasure the event may give to many descriptions of people. Title: News from the West Indies.